People swear by salting eggplant first to leach out the bitterness. The truth is, bitterness has already been bred out of most eggplant varieties, so there's no need to salt them. If you use small eggplants, you don't have to peel them either. 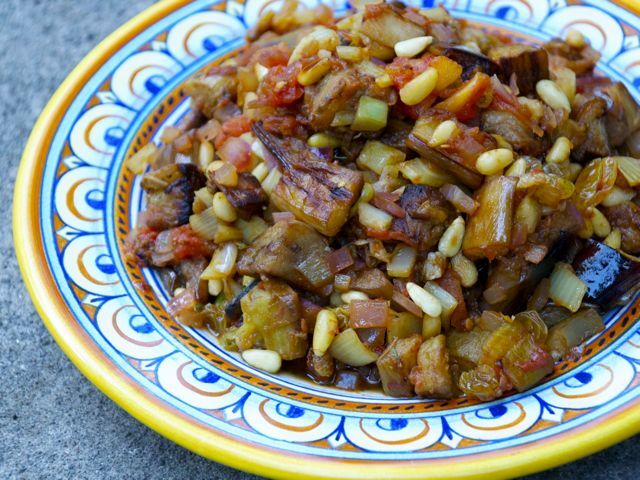 This recipe uses whole eggplant as is and makes a beautiful caponata that you can serve with almost anything. I usually make a big batch because it goes so quickly. People have asked me to jar it and sell it at supermarkets. Not a bad idea! Heat 4 tablespoons of the grapeseed oil in a large, heavy skillet over medium-high heat. Add the eggplant cubes and sauté until nicely browned, about 10 minutes. Remove with a slotted spoon and drain on a wire rack over a drip pan or paper towels. Add the remaining 1 tablespoon of oil to the pan and sauté the fennel and onion until lightly browned, about 5 minutes. Add the garlic and cook for 1 minute. Stir in the tomatoes, scraping up any brown bits from the bottom of the pan. Add the sautéed eggplant, pine nuts, and raisins, and mix gently so that you don't break up the eggplant. Add 2 teaspoons of the vinegar, then taste and season with salt, pepper, and vinegar as needed. Prep ahead: Make the caponata up to 5 days ahead and keep it covered in the refrigerator. Before serving, bring it back to room temperature for the best flavor. To toast pine nuts: Heat them in a dry skillet over medium heat until fragrant, 3 to 5 minutes, shaking the pan now and then.